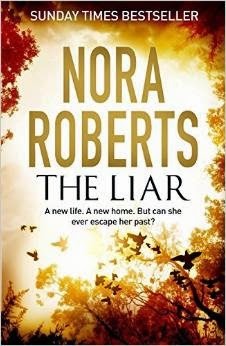 If you count yourself a reader and don't know who Nora Roberts is, then I'm guessing you've probably been living under a rock for a while. Roberts is pretty prolific, generally producing a standalone and a trilogy every year, plus the books she writes under her pseudonym J. D. Robb, but her novels are always quality over quantity. Her latest standalone is The Liar, a thriller mystery about Shelby Pomeroy, who decamps back to her parents' house with her young daughter Callie when her husband Richard dies. Richard's death revealed that he was a liar and a cheat, whose fortune was built on a stack of debts that Shelby has now taken on. As she works out how to support herself and her daughter, Shelby meets the handsome carpenter Griffin Lott, but also has to face up to the fact that Richard's death doesn't mean she is free of him. In Shelby, Roberts has created a likeable character who I rooted for from the moment I met her. She's got faults - her naivety about Richard and the way she gave in to him made me want to shake her. I think Roberts is well aware of that fact - I think Shelby's best friend Emma Kate is a stand in for the reader, sharing and conveying our thoughts and feelings, and we get to know Shelby as Emma Kate re-learns her best friend. Griffin is a lovely "hero". I put the word in quotation marks because he isn't actually a hero, he's just a normal, decent, funny, intelligent guy. Let's face it, that's kind of heroic! While his relationship with Shelby is fun to watch unfold, it's his relationship with her daughter Callie that is truly beautiful. Part stepfather, part friend, he and Callie make an unstoppably cute team. That cuteness is countered by the darkness of the novel, which we get a hint of from the opening chapters, as Shelby works to unravel the effects of Richard's life of deceit. When his true colours are fully revealed, trouble comes to Shelby and her hometown, turning a picture perfect community into a target for some very bad people. Roberts niftily weaves together a series of mysterious happenings and dodgy characters, and although I suspected I knew what was going on, there was no way for me to guess how Roberts was going to bring it all together, and plenty of other things I didn't guess. In addition to the central big mystery, I must give a little bit of space to the slice of small-town life that Roberts offers up. I enjoyed reading about the arguments in and politics of the small town Shelby moves back to, and particularly loved her stand off with arch enemy Melody - it was funny at times, but also heartbreaking for both women. In The Liar Roberts has created yet another fantastic story, and told it with dexterity, some surprises, a dose of darkness, and a lot of warmth. *The Liar is released in the UK on April 16, 2015. I thought Griff was a hoot!